Katana Swords and Samurai Swords for display. These very affordable swords are made of stainless steel and designed in traditional and unique styles. These are for display purposes only and some swords include tabletop display stands. Battle Samurai Swords are 38 7/8th inches overall and are great for a display piece. These swords have a 26 ¼ inch blade. The blade is crafted of stainless steel and features a simulated temper line, like the temper line featured on real authentic samurai swords. The handle has imitation ray skin that has a traditional Japanese black cord wrapping. The tsuba is crafted of a cast metal that is finished in a black color. The tsuba of the Battle Katana Samurai Swords has etchings of a dragon. 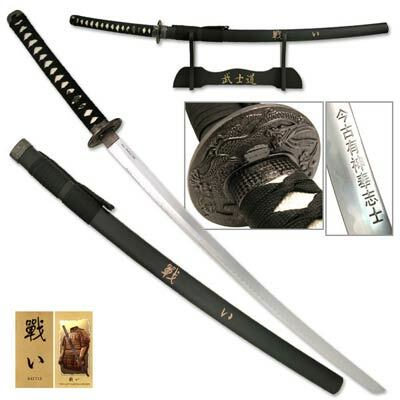 These samurai swords also include a black finished composition scabbard. The scabbard permits the sword to be displayed with the blade out or secured in the scabbard. Lastly, these swords include a display stand. Buy these Battle Samurai Swords for an affordable and unique display for only $39.99.